Build it ourselves with donated labor, know-how and materials! 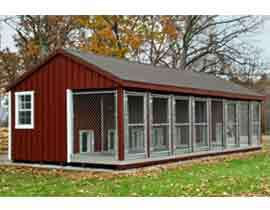 Kennel architectual plans are available online either free or for a nominal cost. So we would need the donated time of a project manager/general contractor, a builder, labor volunteers and a combination of purchased and donated building materials. So, if you, or anyone you know would like to contribute your time and/or materials to this project or help fund raise, please contact us ASAP! Why is a Kennel so Critical to Saving Roswell Dogs? It is often a frantic effort to get the dogs and cats pulled from Animal Control in time. Their first stop is the Vet. Then we need to evaluate the dogs before selecting a temporary Roswell foster who will foster until the pups are transported to their rescue. But often, fosters are full, so we end up temporarily boarding the dogs, which gets expensive. This picture is an example of an ideal kennel. If we purchased it at full retail, this particular kennel which holds 8 dogs, would cost $27,380. It includes heating, air conditioning and plumbing. As mentioned, with volunteer labor and donated material, we could build it at a fraction of that cost.